Jon Hable gave a phenomenal speech at GDC 2010 last year that drove home for many people the importance of knowing gamma – inviting him into your house, and serving mr. gamma a tasty beer. I recently had to do the same. We use a baked lighting pipeline for our levels at work, it’s quite simple, piggy backing on Illuminate Labs excellent Turtle rendering plugin. The process involves iterating lighting inside of maya for an area until we get a look we’re pleased with. Then we write the lighting data out as abstract point cloud information where it “magically” becomes reassociated with the geometry in the running game. 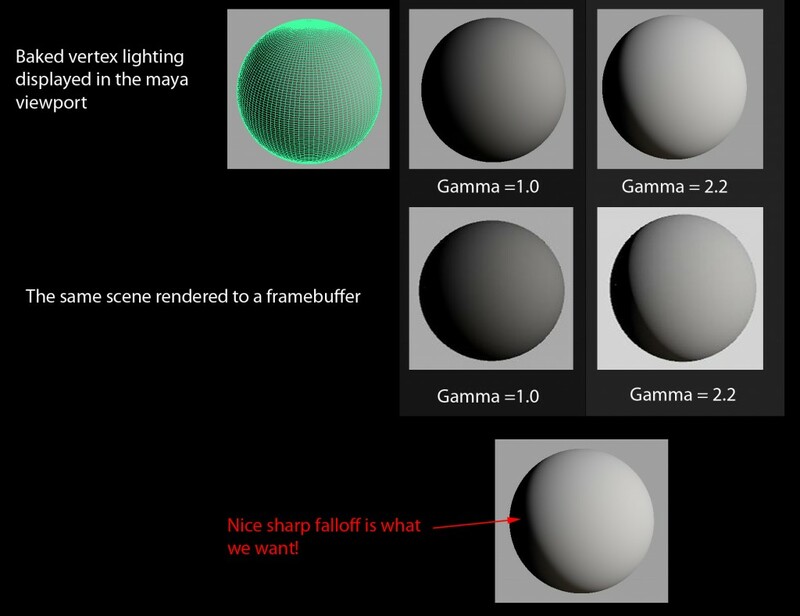 The in viewport gamma correct display is made possible by this simple GammaCorrectColorDisplay.fx shader to be used with maya’s HLSL Shader plugin. Now that I have a handle on our linear lighting pipeline from start to finish, I’m going to try and poke around a bit more and see what other little discrepancies like this continue to plague us. A linear light rendering pipeline is truly a deep rabbit hole.